1st ODI India vs New Zealand: It was surprising as the umpires asked the players to leave the field due to excessive sunlight. 1st ODI India vs New Zealand: It was surprising as the umpires asked the players to leave the field due to excessive sunlight. Dhawan was the one who said the umpire that he could not pick up the ball because the sun was ruining his visibility. 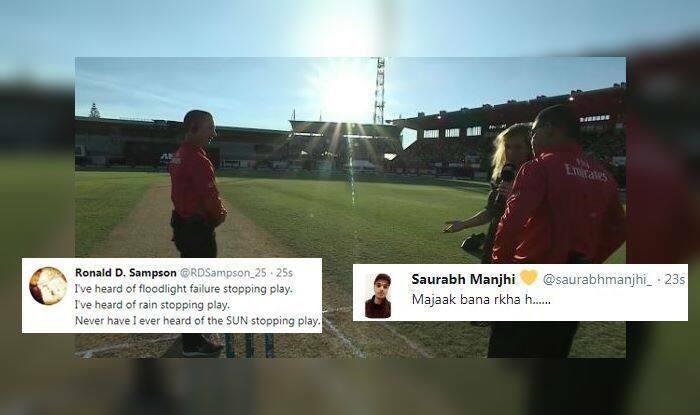 With the score 44/1 in 10 overs, the players left the field and that has baffled fans who cannot believe that sun has interrupted a cricket match, something that does not happen usually. Earlier, it was Kuldeep Yadav’s four-wicket haul that bundled out the Kiwis for a paltry 157. Shami also became the fastest Indian to pick up 100 ODI wickets. Play suspended due to too much light. Earlier, New Zealand won the toss and opted to bat against India in the first One-day International of the five-match series on Wednesday. Both wrist spinners – Kuldeep Yadav and Yuzvendra Chahal – figured in the India playing XI, apart from all-rounder Vijay Shankar. Dinesh Karthik has been dropped at the expense of Ambati Rayudu, while Kedar Jadhav retained his place. Mitchell Santner and Doug Bracewell returned for New Zealand.